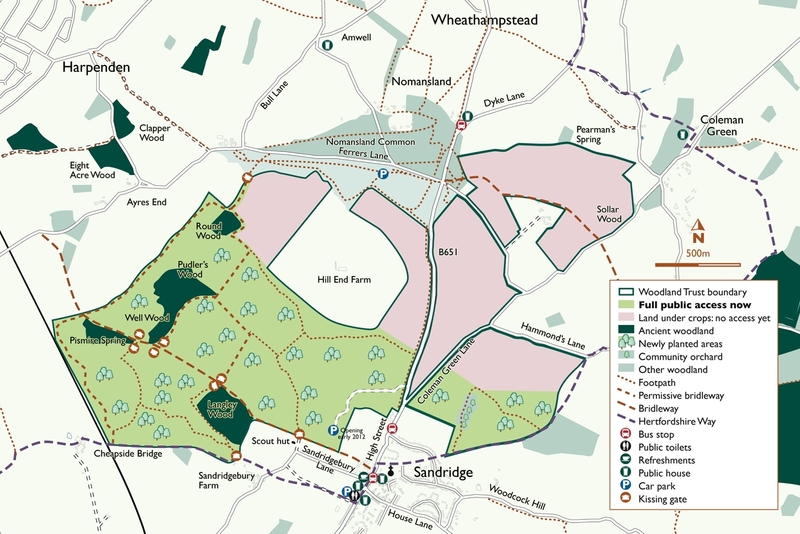 Heartwood Forest is located either side of the B651 between Sandridge and Wheathampstead Village and 2.5 miles north of St Albans City Centre in Hertfordshire. There are currently 12 different entrance points into the forest which are well linked to existing footpaths and bridleways. By train – There is a good train service to St Albans station 2.5 miles away from Heartwood Forest. This includes Bedford to Brighton via East Croydon, Luton to Sutton via Hackbridge and Luton to Sutton via Wimbledon. There is on average 9 trains per hour Monday to Friday with 6 trains per hour on Saturdays and 5 on Sundays. Harpenden train station is also 4.7 miles with a good service on the same line. On the bus – There are two buses for Heartwood Forest that stop in Sandridge village. The 304 from Hitchin to Potters Bar via St Albans and the 620 from Hemel Hempstead to Hatfield via Harpenden. Monday to Friday there are 9 304 buses per day with 7 on Saturday and 3 on Sunday. There are 18 620 buses Monday to Friday per day, 12 on Saturday and 7 on Sundays. The nearest bus stop is outside Pound Farm opposite St Leonard’s Church at entrance point 1. Walk through the farm yard and up the bridleway to Heartwood Forest. By bike – There are several good cycle approaches to Heartwood from each major village and town. See cycle route and footpath map for more information. Take care if using the B651. The road is narrow, winding and busy. There are several bike stands for locking bikes in the car park. 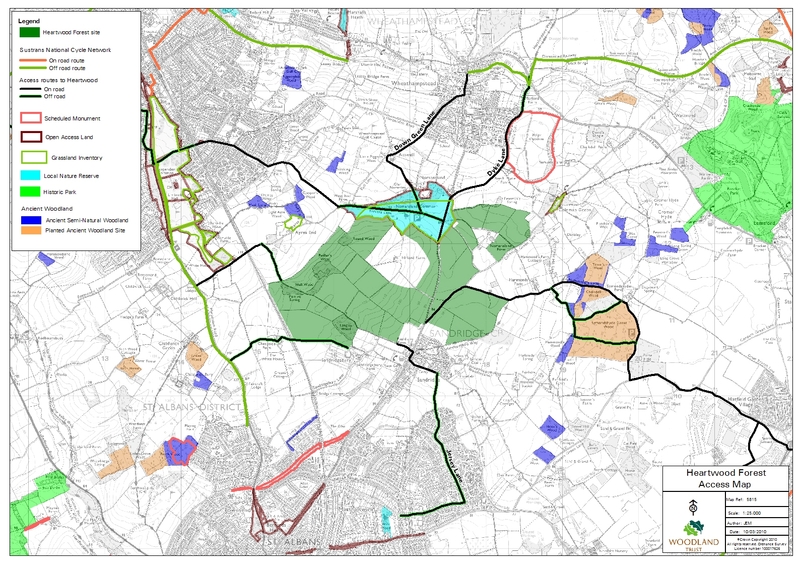 On foot – There are good walking routes from each major village and town around Heartwood. See cycle route and footpath map for more information. Paths become slippery and muddy when wet. Take care crossing B651. By car – The car park is situated off the B651, the main road that runs from Sandridge to Wheathampstead. The nearest postcode is AL4 9DQ and there is a brown tourist sign pointing into the car park from the main road. Nearest public toilets – Sandridge village hall. Disabled facilities are available with RADAR key. No baby changing facilities. Nearest refreshments – There are 3 pubs in Sandridge village along with a general store selling hot food and tea and coffee. To the north there are two pubs close to Nomansland Common and one to the east. See access map for locations. Paths and gates – There is a developing network of paths in Heartwood Forest including a public footpath and two bridleways. The majority of the paths are unsurfaced and can become muddy, slippery and at times waterlogged. There are some moderate gradients leading up from Sandridge village. The network of public footpaths and bridleways in and around the forest, together with other paths in the existing ancient woodlands, provide opportunities for a variety of walks in the area. For current information on public transport contact Traveline on 0871 2002233 or http://www.traveline.org.uk and for more information on public footpaths in Hertfordshire contact Hertfordshire County Council on 0300 123 4047 or www.hertsdirect.gov.uk. Hello. Arrived at Heartwood 6.20 this evening to walk the dogs on a lovely sunny evening – gates closed! Have they forgotten that it’s now BST so should be open to 8pm, as per the website? Please could you put me on the mailing list for forth coming events. Woodland Yoga at Heartwood Forest – Sunday September 9th, 10:30am – still a few places left!